Teach students how to create a compelling and relevant advocacy message, understand how to boost Mental Health, and access Mental Illness care. 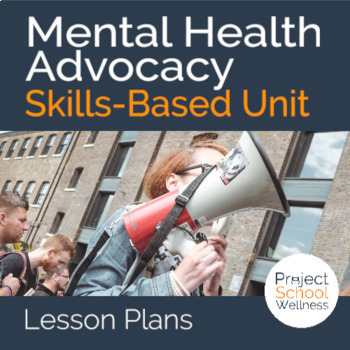 This skills-based health education unit comes with eight lesson plans designed to teach students about mental well-being and how to use the skill of advocacy. Surprised are fun. But not when it comes to spending money. Be sure to check out the full preview to see exactly what’s included in this resources. Seriously, click here to review everything that’s included with this purchase. >>> ENGAGE STUDENTS with interactive health lesson plans connected to relevant health topics and focused on building vital life skills. >>> SAVE TIME & ENERGY with this health education unit. Each lesson comes with a detailed teaching guide, outlining every aspect of the class period from start to finish. There is NO EXTRA PLANNING required and minimal prep before class. Skills-Based Approach - This resource teaches student vital knowledge and skills they need to take ownership of their well-being. Standard Aligned - This resource was designed in connection to the National Health Education Standards. FREE updates for life - Get access to this product and any future updates with your one-time purchase. NHES #8: Students will demonstrate the ability to advocate for personal, family, and community health. NHES #7: Students will demonstrate the ability to practice health-enhancing behaviors and avoid or reduce health risks. NHES #3: Students will demonstrate the ability to access valid information, products, and services to enhance health. Download FREE Lesson Plan Bundle - - Lesson plans, classroom posters, student activities, and more! Upon purchasing you’ll receive a link to access your resource on Google Drive. Using Google Drive is the easiest way for us to edit and update resources. This allows us to quickly respond to feedback, share new features, and make sure this product is serving you well!